I have the unfortunate habit of setting out to take photos of plants when it's just about to rain, cloud over, turn into night-time or glare in the unfortunate way which dots white patches all over the place. Today's nigh-on fiasco was to go to the sea when the weather was wondering whether how much mist to through over the scene. Such is life. Such is seizing the moment. It's often quite random the one you are free to seize. And I didn't really chose this road either. It was where I happened to be when I looked to see what there was. In a way, the less promising the start, the more satisfying the conclusion. Some kind of Sow Thistle? Take the picture above. 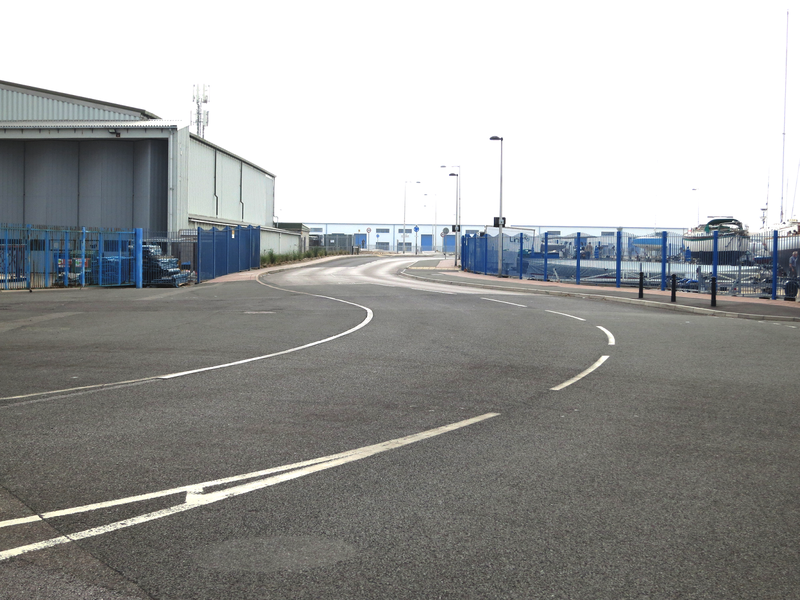 See the bollards on the pavement? (Over the road on the right.) I crossed to them and walked along beside the fence as far as the bend - the space of three lamposts. All the plants in this post were found along that span. In other words, they are in view - but you'd hardly know if you didn't look. 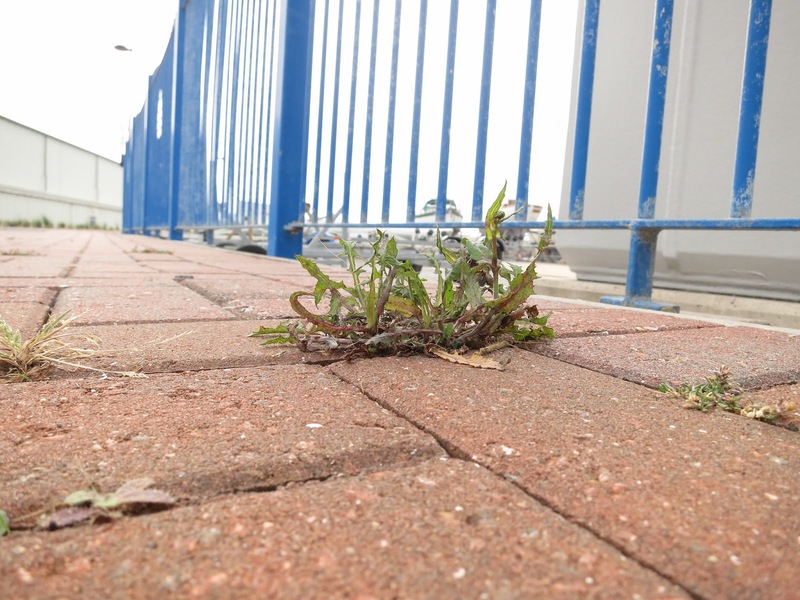 This sow thistle, was about three inches high and caused enough of a blodge on the pristine brick pavement to stand out for a starter and draw me over. Notice the area is litter-free? That's often a bad sign when you're looking for street plants. But I was in luck. Not only is this sow thistle there but it has neighbours. 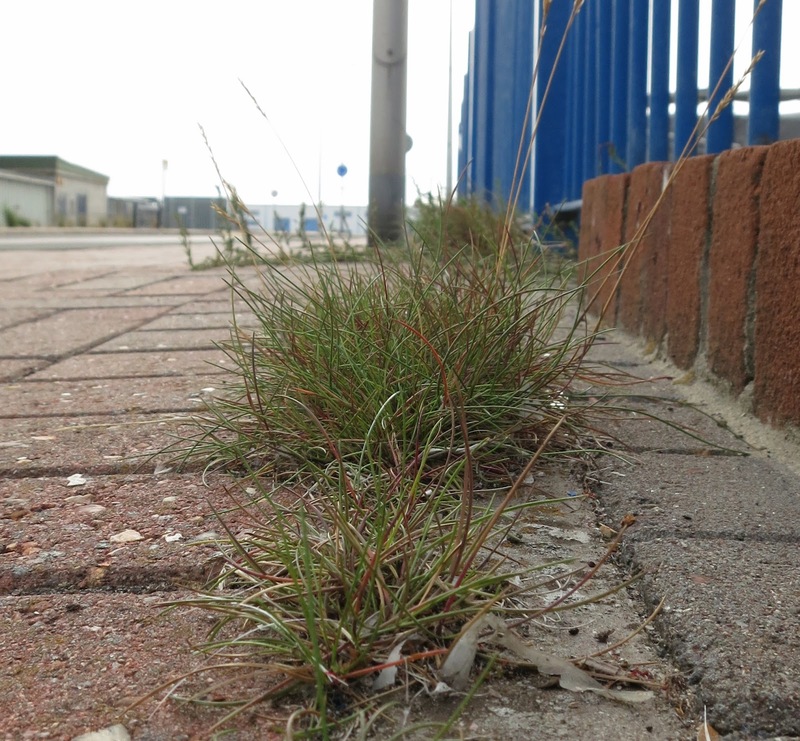 There's some grass, and two others plants - one of them of the same ground-hugging kind as you'll see below. People interested in sport and spectacle may remember that the sailing events for the 'London' Olympics of 2012 took place in Dorset and were based at the National Sailing Academy on Portland which had been developed with just that in mind. I don't know what this plant is. You can guess its size by comparing it with the bricks of the pavement and the small stone. This road near The Academy is crisp and clear with nothing there beyond what's necessary. A road for cars. A pavement for people. Places for boats to spend the winter. Places for boats to be built and repaired. Warehouses. New. Stark. It was tempting to brighten this picture to show the red pods more clearly. But a grey day is a grey day. There used to be huge oil tanks along this edge of Portland. They were dug up, knocked over, bashed out of the way and the ground levelled for the kinds of industries which take place in 'units'. Some have plantings of grasses and other tough plants. I'm not sure if these clumps are truly wild or escapees. The plant on the right) is Knotgrass (Polygonum aviculare agg.). It was growing along the ground, away from the long blue fence, then standing upright. The segments of its stem looked as if they'd been plugged together in a row. It has pretty little pink flowers which are even less visible than the plant was when I started along the road. It's not a flowery road. It's not a very flowery time of year. But here's another sow thistle; this time taller - with a yellow flower and white and fluffy wind-powered seeds and brightly coloured leaves. Yes. By the last lampost before the road curves right . . .
From the long view - not much in the way of wild flowers. Close to . . . ? Of course - they are always there! 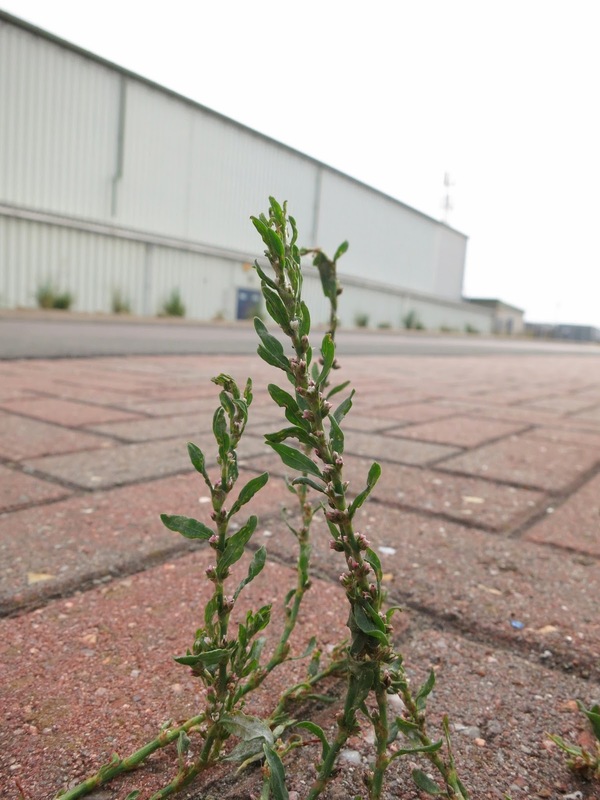 Do you write about street plants on your blog? Join other Loose and Leafy readers by linking with your discoveries. See the Street Plant Bloggers page for more info. Hi, had a sneak peek at your plants as you come up on my iSpot home page... 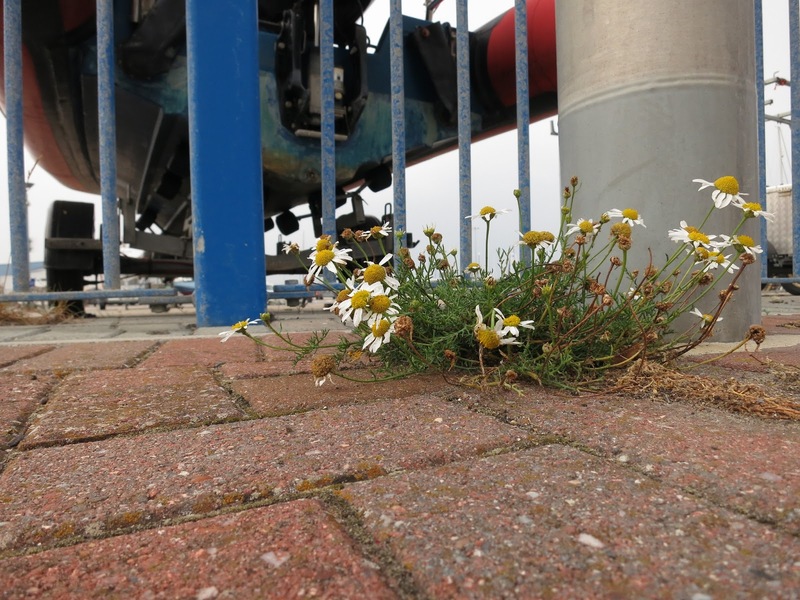 Think the daisy plant could be Scented Mayweed, some street plants can look quite different to a heathy plant, due to been cut back and their growing condition. Hello Amanda. Thanks for the suggestion. Will you be putting it on the iSpot page? I've been raking back through my blog because I think I've photographed the same kind of plant not far from there and that would help confirm. Can't find it despite knowing which post it appeared in. A while back I got in a muddle about how to use labels and deleted masses from earlier posts. Mistake! 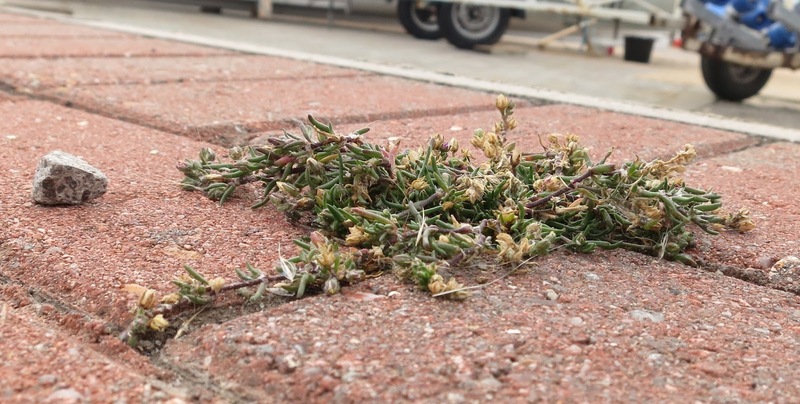 I have just been to iSpot and back thinking the flat plant might be Greater Sea-spurrey - Spergularia media and find someone has suggested Sand Spurrey (Spergularia rubra). I'll wait and see what happens before putting any ID on here. 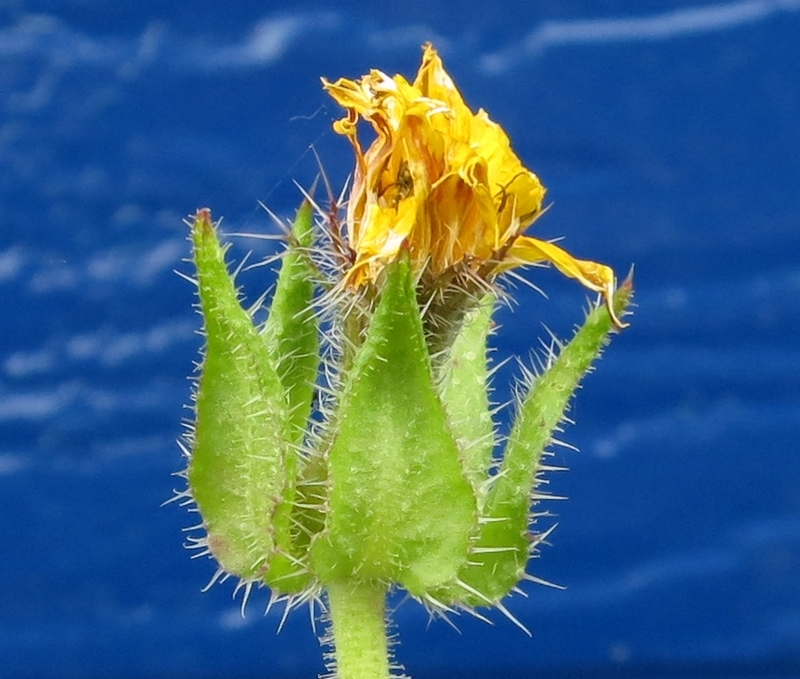 I put nearly everything from this blog on iSpot - even plants I think I know because I often find I don't! The daisy looks a lot like chamomile (Matricaria spp). Do you know them? Some have very divided (lacy) leaves, and some grow wild here in the USA. You always make the plants look so lovely in the urban landscape. oh that is very urban! Reminds me on a post from a landscaper in Toronto. He recommended certain plants based on what was growing in the cracks. I think you will like it! I think the daisy-like one might be a type of anthemis. 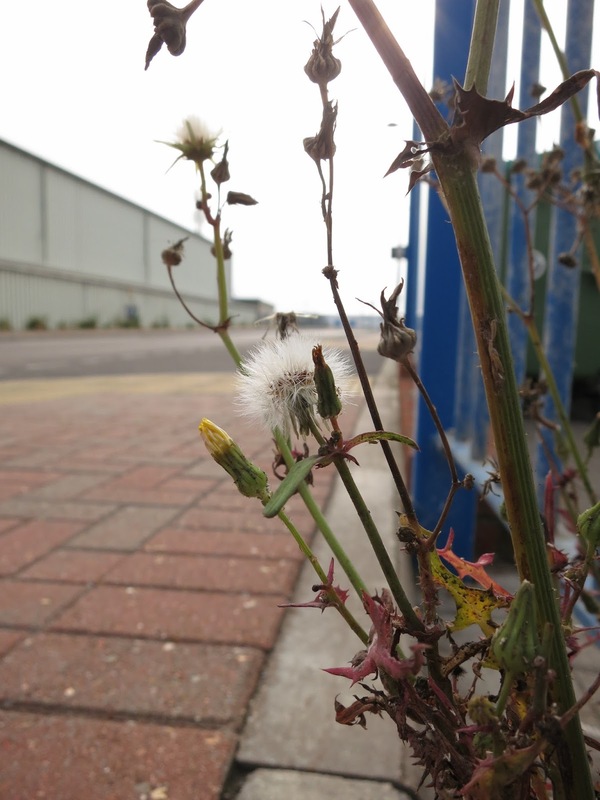 Love this post and the whole idea of looking at 'weeds' more carefully and appreciating them as plants.